The massive earthquake and resulting tsunami that struck Japan on 11 March have caused widespread destruction and suffering. More than 8,000 people have died in the disaster, thousands are injured and at least 12,000 are missing. Many people are living in evacuation centres as 14,000 homes have been destroyed and around 100,000 are damaged. Kwadjo & the Stars will be back playing their classic blend of funky tunes! A live backline of drums, bass and guitar and you singing vocals from a selection of 200 songs. Drinks on special offer on the night! All proceeds to be donated to the relief effort. 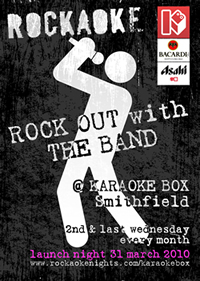 For more information about Rockaoke or any of our Wednesday events please contactafandi@karaokebox.co.uk or call us on 020 7329 9991.